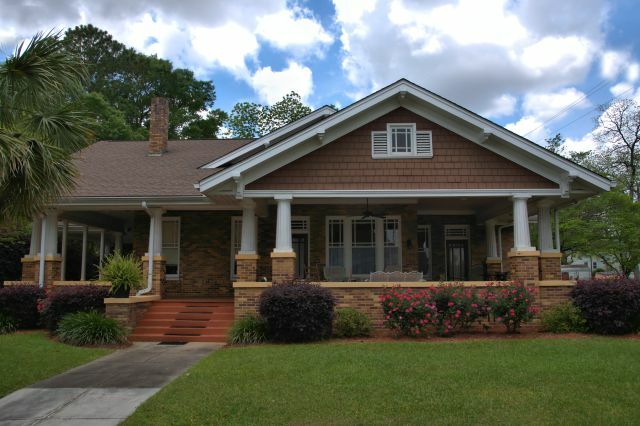 This Craftsman bungalow has always been one of my favorites. According to Trish Lilly Jones, it was owned by Ms. Lillie Mobley (1898-1983) until her mother, Barbara Wilkinson, purchased it in 1986. Trish lived here when she was in high school and notes that it had a “great Sweet Potato Parade-watching porch”. Trish lives in beautiful Madison, Georgia, these days, and publishes a blog, The Old Post Road. She’s an accomplished artist and I think you’ll enjoy her paintings. My grandmother actually sold the house to the Motes in Mid to late 1985. The Motes were employed with Flintstone, transporting mobile homes. They lived there until Flintstone went bankrupt and they moved on. My Grandmother , Mrs. Thelma Roberts, bought the home and moved from our farm to town, after the sudden death of husband in January 1980. She rented the apartment out back to a school teacher. It was a big change for her after living in the country most all her life. After five years in town she sold the house to the Motes and moved Back to her home at the family’s farm on the five bridge road, where our family has lived since the late 1700’s. Johnnie and Elly Motes owned this home in the mid 1980s. Was a great place to live..